My family has been using Jimmie and Lotus forever and we knew from the moment we got engaged we needed him to be our florist! He is so detail oriented and organized in every way. Not only was he my wedding florist but he also did the arrangements for my bridal shower too. We've received numerous compliments on the flowers and would recommend JImmie and Lotus time and time again! I got married in September 2017 and I am SO glad I worked with Jimmie on flowers! From when I first contacted him until the wedding day, he showed he really cared about my wedding and that I wasn't just another customer...and his floral creations are absolutely stunning! I was looking at 5-6 vendors and sent all of them the same information about my flower preferences, the wedding theme, how many bridesmaids, etc. The others didn't pay much attention to this info and basically asked me redundant questions when I visited in person, which was a disappointment and a waste of time. When I walked in the door of Jimmie's shop, he greeted me warmly and showed me to a table where he had already prepared several vases of flowers specifically for our meeting. He created a sample bouquet and took a lot of notes on each of my bridal party and family members. 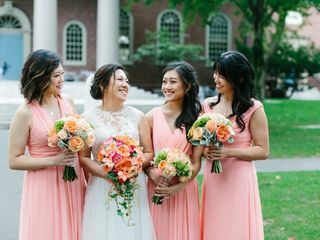 He described his philosophy for wedding flowers and how to make each person feel special - my grandmothers would get different flowers from my mother and mother-in-law, and my maid of honor's bouquet would be different from my other bridesmaids. Two weeks before the wedding we met again to finalize the flowers, and because it was sort of late, he even drove me home to Cambridge. The day of the wedding, my mom was nervous about everything and was afraid we would all be late. Jimmie and his staff arrived in the hotel and his presence was like a whirlwind. He gave all of us our flowers in beautiful long vases, and assured my mom it would all be fine! I haven't met many people who could catch my mom off guard but his charm helped ease the anxiety. 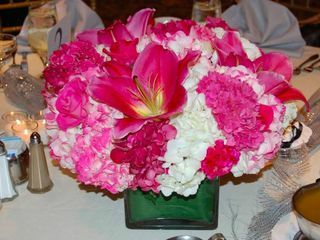 Throughout the wedding guests remarked how breathtaking the flowers looked. My parents took home the centerpieces afterward, and about half of the flowers were still in healthy bloom 10 days later! I can't recommend Jimmie highly enough. You will not go wrong with him! Jimmie is the best! He is an absolute joy to work with. He has such great energy, he may have been more excited about the wedding than me! :) Jimmie knows what he's doing and takes his work seriously. He understood my vision and style immediately, and it made the whole process comfortable and stress-free. His work is beautiful and he uses the freshest flowers. I could not have been happier with how everything turned out. 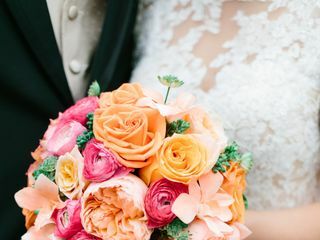 When it comes to booking the right wedding vendor, it is important to find someone who you can trust and who will service an event that isn't just beautiful but reflects who you are as an individual. Hands down, Jimmie was one of the best decisions that I made for my wedding. He is incredibly talented and cares deeply for his clients. Although he is opinionated, he listens closely to your requests and will work with you to stay within a budget that is affordable. For instance, my favorite flowers are peonies and orchids but unfortunately my wedding budget did not allow for me to incorporate these into my arrangements. Jimmie surprised me on my wedding day and included a few stems in my bouquet and cake decor, stating that he wanted the wedding to be a reflection of me. All of my guests were raving about the flowers, and even my mother (who is quite hard to please) wanted to meet him to thank him personally for his help. He also has existing relationships with many vendors and is familiar with many spaces which is a huge plus. I would recommend him to anyone who is getting married in the Boston area--you will not be disappointed! Jimmie is amazing to work with. He is incredibly creative, passionate, detail oriented and fair. He has a loving personality that shows how much he loves what he does. We are so lucky we sued him for our wedding. No one could get over how gorgeous and unique the arrangements were. Jimmie exceeded all our expectations. The flowers for our daughter's wedding were over the top spectacular! He met with us and got to know my daughter and me and provided spectacular bouquets for the wedding party, two beautiful arrangements for the church and amazing high and low table decor. We couldn't be happier! Jimmie was incredible! I told him I wanted orchids and he created a magical orchid wonderland of tablescapes and centerpieces. He was there at 6am to make sure my Chuppah was assembled properly in a way that was beautiful. He made sure everything worked perfectly together and that I was satisfied. 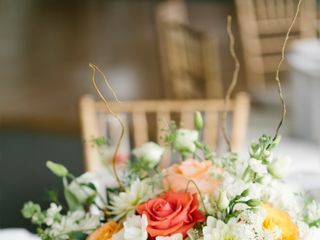 Jimmie was in constant communication with me and the venue to make sure all my ideas could become reality and he perfectly executed the floral displays beyond my wildest dreams! He truly made my wedding everything I dreamed it would be! Lotus Designs were great to work with. Ideas were provided by Jimmie and he was very receptive to our ideas as well. Great sense of design with a wonderful humor made working with Lotus Designs very easy. I loved working with Jimmie at Lotus Designs. He immediately understood exactly what I wanted for our wedding. He was so flexible and accommodating throughout the entire year long process. He made several arrangements for me during the process so that I was able to visualize what it would all look like. Since Jimmie wasn't familiar with my venue, he made it a point to go look at the space and gave helpful feedback about where we should put flowers. Jimmie was there on time on the day of the wedding to drop off the flowers and the space that he designed was amazing. People could not stop talking about how beautiful all the flowers were. Jimmie is by far the absolute best florist! I felt so fortunate to find him and to have had the opportunity to get to work with him. He is so sweet and really took the time to get to know what I wanted for my wedding. He spent time with my mom, aunt, and cousin and really created beautiful center pieces for the church and the wedding and even gave each of us cute little bouquets to go. I was concerned about costs given how expensive everything is in the Boston area, but Jimmie really worked with me to make the wedding absolutely beautiful and stay with in out budget. I would highly recommend him. If you decide to work with Jimmie at Lotus Designs for your wedding flowers, you will not regret it! Jimmie is extremely talented, creative, and whole lot of fun! He is a man who clearly loves his job and making people happy. We went to Jimmie mainly for bouquets, boutonnieres, and a couple of small arrangements as we did not have flowers on the tables at our wedding. After showing Jimmie pictures of the bridesmaids dresses he immediately had great ideas for all the flowers. In fact, he ran to the back of his store and created sample designs right on the spot! On the day of the wedding I was blown away by how gorgeous and detailed his arrangements were and he took great care in delivering everything to the venue and the hotel where we were staying. We couldn't have been happier with Jimmie's great work! Jimmie was so talented!!! Everything came out more beautiful than I could have ever imagined. I was shocked how gorgeous the flowers were, and how affordable the flowers were too. Jimmie is the best! He is very knowledgeable and willing to work within any budget! We had plenty of meetings with him so he always knew we were on the same page! The day of the wedding he was on time and gave me a big hug! He is super sweet and always gave me a small bouquet whenever we left the shop after a consultation. We have used him since for arrangements that we need and my husband sent me birthday flowers form him too that were amazing! He's the best! After appointments at every major and not-so major florist in Boston for our wedding, Honey at Lotus Event Design was the clear winner...by a mile. She perfectly brought EVERY single aspect of my vision to life for our winter wedding. Other big name florists in the area told me it couldn't be done, and that it would cost TWICE as much as Honey and her team charged us. She is professional, warm, funny, and knows her stuff. She painstakingly attended to the most intricate details, and when problems arose with having to set up in our ceremony venue, in very very limited time, she and her team somehow pulled off erecting a HUGE, 10- foot tall, hand-made by her and her team chuppah (with a piece by piece assembled chandelier), all of the candle arrangements down the aisle, and all of the pew arrangements. THe reception flowers and candles were BEYOND anything I could have dreamed up, they were just PERFECT. She is a true PRO and I will be trusting all of my floral business from here on out, to Honey and her very capable team! What can i say, Honey is AMAZINGGGG! She did the flowers for my brother and sister in-laws wedding and we loved them. It was a no brainer to visit her again for my own wedding the following year. I was a bit worried becuase i was getting married down the cape, didnt know if it would be more expensive working with Honey in Boston, but it was not and the flowers spoke for themselves. I had an idea for the centerpieces to use lanterns and Honey saw my idea and totally took it to the next level. Even on our sweatheart table there were so many flowers we didnt even have room for plates! 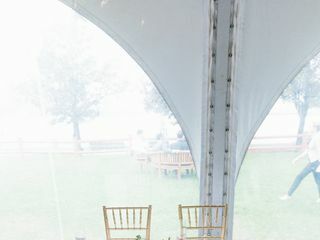 The venue coordinator was so impressed with everything, Honey even made the trip down to my venue a few days earlier so she could see the space as she was not familiar with it. When we were there i showed her the candles i bought to put in my lanterns, she didnt like them and she went out that day and got new ones for me. She really just wanted to make sure everything was perfect for me, and she knows what she is doing trust me. We live in boston still and my husband will now only buy flowers from them all the time. 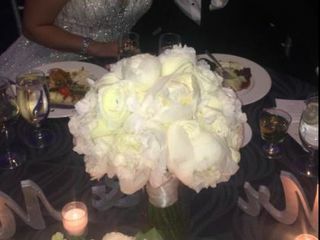 Did i mention that the centerpieces lasted for 2 weeks after my weeding, i was getting emails from everyone that took them home on my honeymoon raving about how beautiful they were. You can not go wrong with Lotus, you will be in good hands!!! I worked with Honey from Lotus Designs for my wedding in August. I only used a florist for flowers for the wedding party and was extremely satisfied with what Honey created. I didn't have many specific ideas going into it, and Honey did an amazing job of reading my style to create simple but beautiful arrangements. Her prices were reasonable for the flowers selected, and they were delivered with no issues. She was very flexible and responsive while I was planning the wedding from out of town. I love Honey's designs and flowers! We have an in-store meeting prior to the wedding with Honey and she showed me her designs and asked about what I needed. She's very experienced and the process was quick and efficient. I have all-roses centerpieces and her roses are huge!!! It was simple, but flourishing. My ceremony flowers are greens and willows, which really highlighted the altar. The wedding parties also love the bouquets. I even compare her price with another two local florists and hers is the lowest, without diminishing the quality. Highly recommended. Lotus Designs is absolutely the best florist in New England. Honey is an exceptional florist; her personality, her ideas, her talent and her attention to detail absolutely blew me away. She took the time to make my ideas become a reality and created magnificent dramatic and elegant centerpieces and beautiful personal/bridal party bouquets that were nothing less than phenomenal. Honey is top notch all the way and is one of the kindest people I have ever met. I went to dozens of florists before finding Honey and I will tell you I literally broke down into tears when she called me into her shop and showed me the real life sample of what I wanted for my wedding. You can only imagine what it was like on my wedding day at the Fairmont Copley Plaza. The entire room was filled with the most amazing, exotic and exquisite flowers arranged in perfection upon the most beautiful crystal candelabras surrounded by the soft glow of candlelight below. Words can not express the amount of gratitude I have for Honey. She is a wonderful person and I am so thankful I chose her. Couldn't have ever dreamed of a more perfect wedding. There is no doubt in my mind I made the right decision-she made my day a dream come true. Book Lotus as soon as you can!!! I was totally clueless about flowers, I just knew that I wanted something simple, beautiful and elegant. Honey, who works at Lotus was a God send. She created more than I could have ever imagined and she was an absolute joy to work with and I felt completely comfortable that she would do a wonderful job. When I walked down the isle and saw what she created I was speechless. They are incredible! My wedding was over 2.5 years ago and I still remember this vendor. They were simply AMAZING, FABULOUS, my Favorite vendor....I can't say a single bad thing about them. Every staff member I worked with was knowledgeable and patient. The worked with me the day I came in to create a sample bouquet with fresh flowers that was perfect (not just showing me pictures like other vendors...and you can't beat the real thing)....they even gave me a sample to take home. 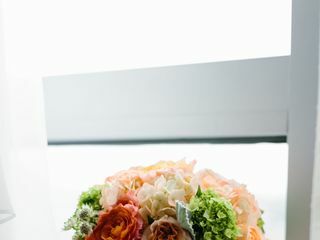 Honey, the staff I worked with, even researched different vases and containers for my table arrangements and made terrific suggestions that fit my taste, budget and style. The flowers were literally perfect....a guest who means a lot to me even said that he initially thought that the flowers weren't real because each bloom was unblemished. I just had to give Lotus Designs a sense of what I wanted and in return I got magic. Even when I went in for appointments and they were super-busy, I was never overlooked or rushed. In addition, all the deliveries were on-time and they even stayed to help pin on corsages etc. They were AWESOME! I don't mind spending a few minutes writing this up because if it helps their business, I'm only too glad! We loved working with Jimmie for our wedding! Not only was his work beautiful but he also worked with us to find exactly what we wanted within our budget. We are so pleased with how all of our flowers came out on our wedding day. Throughout the process, Jimmie was such a joy to be around. His flexibility on meeting times and adjustments is something a bride can only dream of. I highly recommend Jimmie for any events. Jimmie is an amazing artist and took so much time meeting with us over and over to make sure that we were happy. The quality of what you get with him for the price is unbelievable. He's the best and we couldn't have been happier with how everything came out!